I'd like to introduce you guys to one of my new sponsors, snnewt! Samantha has an adorable etsy shop full of great accessories! A really cool sidenote: She so generously gives 10% of all sales to Doctors Without Borders. Really, really cool. All items come packaged, which is an excellent bonus for this time or year! 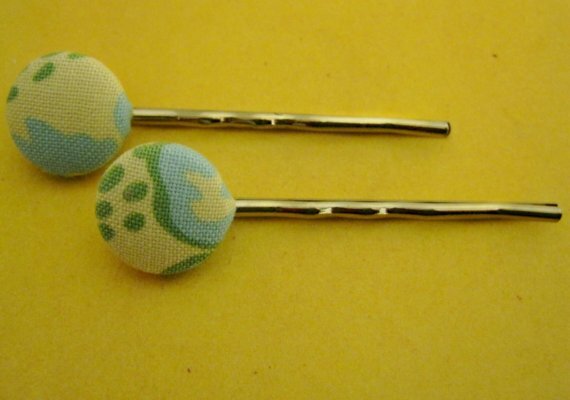 I especially love these covered button bobby pins. Loving that mustard fabric! Remember these bobbies I posted on my Favorite Things Friday post last week? Well Samantha is awesome & is offering you ladies a chance to win them!! Leave a comment here telling me what your favorite item in Samantha's shop is. 1. Follow BOTH oh, sweet joy & snnewt on twitter. "@ohsweetjoy is giving away fun bobby pins from @snnewt on her blog! www.yellowsongbird.blogspot.com"
3. Follow Yellow Songbird via Google Friend Connect. loving the mustard covered button headband! in love with her cascade ruffle skirt! I follow both of you on Twitter (@mahalmichelle). I follow you on GFC (Michelle-esque). I love the lemonade ruffle tee! I love the Magenta Garden Party headband. i love the Covered Button Headband- Vintage Harvest Moon. Cute fabric! I love the satin silk yo yo necklace in Rockin' Robin in the Sun. Thanks for the chance to win! I love the Covered Button Headband- Moonlight Tonight!!! the ruffle skirt ........ and all the headbands (I tried to choose a single favorite but couldn't pick)!!! I love the skirt in her shop! too cute! I love the Moonbeam Wishes skirt! 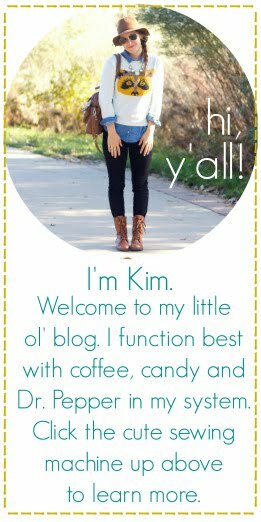 and i follow your blog! thanks for the giveaway! I love her covered button headbands! i ADORE the cascade ruffle skirt! sooo cute! I love this headband!! I would wear it almost everyday! these are so cute!! 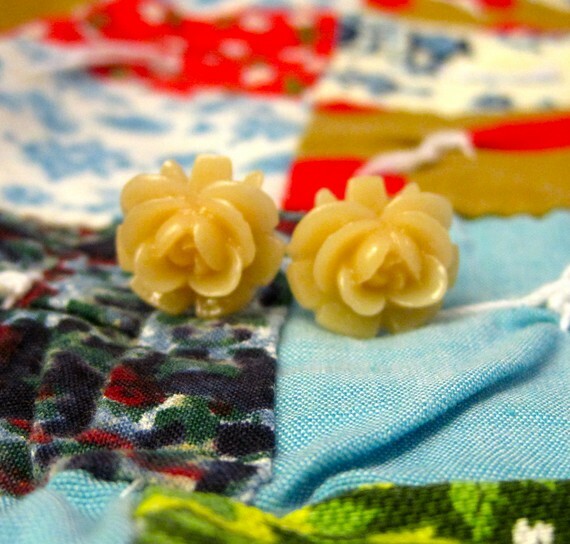 my fave item is the Covered Button Headband- Vintage Browns! Love this shop!! Thanks for sharing! 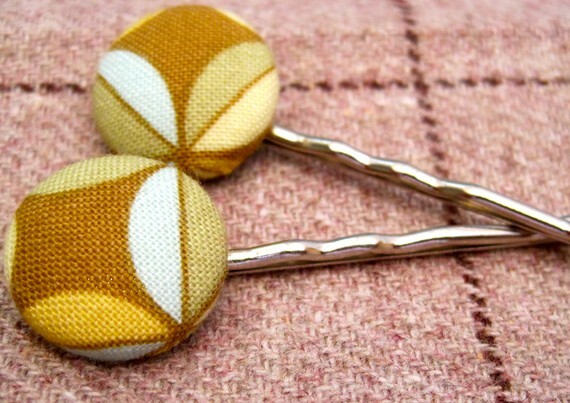 I adore these bobby pins! The Colorful Leaves of Fall design is my fav. thanks for hosting this giveaway,kim! My fave is that cascade ruffle skirt! I follow you on friend connect. I love the unique leaves earrings. I like the green with envy bracelet. i need the ruffle tee! I like the covered button headband! I love the covered button headbands! I follow both via Twitter @Ma21cuteboy!